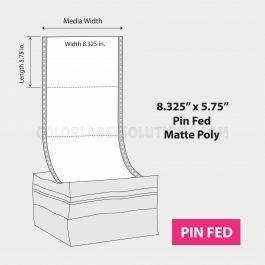 Matte Poly, Pin Fed – Color Label Solutions, Inc.
8.375″ x 10.875″ pin fed/fan fold inkjet coated matte poly labels. 1,000/case. $/case. For use with Epson ColorWorks C831 inkjet label printer. 8.375″ x 13.875″ pin fed/fan fold inkjet coated matte poly label. 1000/case. Price/case. For use with Epson ColorWorks C831 inkjet label printer.